The NYTimes on Ft. Bend county as the most diverse in the nation. "...Sugar Land, the largest city in Fort Bend County, which Stephen Klineberg, a sociology professor at Rice University, calls the most ethnically diverse county in America. By that, he means that this county southwest of Houston comes closer than any other county in the United States to having an equal division among the nation’s four major ethnic communities — Asian, black, Latino and white residents." Houston ranks an impressive #3 in the growth of tech/STEM jobs in the 21st century, ahead of tech powerhouses like SF and Seattle. Austin is #1. Forbes makes the case for Philly competing with Houston as an energy hub (hat tip to HAIF). From what I'm reading there, it sounds like it could be an energy hub, but it would be a *regional* one, not a national and certainly not a global one like Houston. A big chunk of the U.S. population lives in the northeast, and it probably needs a local energy infrastructure hub. Philly is probably not a bad place for that with a port, affordable land, and a central location in the DC-Boston corridor. Houston is a regional energy infrastructure hub too, but we're also the global hub for headquarters and professionals - and Philly is a far cry from that. "As economist Tyler Cowen points out in Time magazine, when you adjust incomes for tax rates and cost of living, Texas comes out ahead of California and New York and ranks behind only Virginia and Washington state. Liberals like Noah often decry income inequality. But the states with the most unequal incomes and highest poverty levels these days are California and New York. That’s what happens when high taxes and housing costs squeeze out the middle class." Some smaller misc items this week after an event announcement: a new preservation group called "Pier and Beam" is launching with a happy hour this Wed evening (11/20) at Mongoose vs. Cobra. If you're interested you can read more at the invite here and register here. Hat tip to Dave. I loved this excerpt from an interview with departing City planning director Marlene Gafrick. Let's seriously hope her replacement has the same friendly attitude towards Houston's model of planning and regulation. Q: After 33 years studying it, do you believe Houston's lack of zoning hurts or helps the city? A: It's kept Houston's marketplace moving, and I think it puts us at an advantage over other cities. I'm not your typical planner. I have seen a warehouse piece of property become a single-family development in just a matter of a year, year and a half. You go to another, zoned city and that takes years to get through the approval processes. The lack of zoning gives us a lot of flexibility as a city to reinvent ourselves fairly quickly, and it allows us the ability to amend our rules fairly quickly to respond to problems. 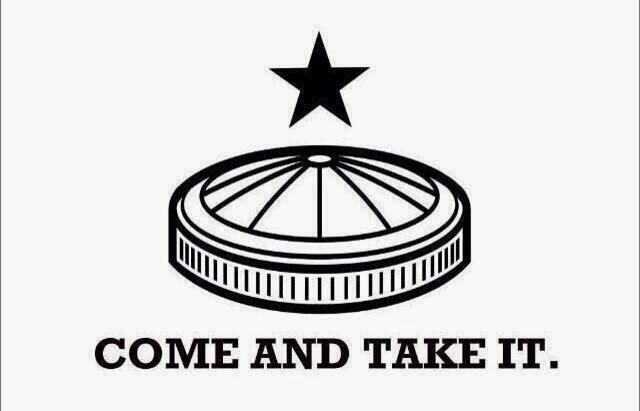 It's part of the energy, part of that can-do spirit that's in Houston. KUHF asked respondents to finish this statement: "Please tell us what you would do if your were the mayor of Houston, using the sentence as a springboard: If I was the mayor, I would ..." My three answers around the Ike Dike, city branding, and METRO are near the bottom here. "Our little squabble illustrates the tactics you can expect to see when the bike wars reach you. Cyclist-commuters may number no more than 2% of the adult American population according to a 2002 report by The Pedestrian and Bicycle Information Center, but they are the ones who go to city council meetings. They'll push for the kind of "Complete Streets" policy that our city adopted, one that gives priority to pedestrians and cyclists over cars. In the abstract, that will sound innocuous, but when the time for implementation arrives, you'll find yourself losing your street parking, street by street, as roads are repaved." Speaking of opportunity, there are fresh links to the Opportunity Urbanism report Joel Kotkin and I created at the GHP web site here (scroll down under Independent Research), including my policy framework. Hat tip and thanks to Patrick. Finally, an interesting half-hour video on the history of Buffalo Bayou and Houston (hit the bottom right corner brackets to see it full size). If you don't have a half-hour, at least watch the opening 40 seconds - good stuff. Hat tip to Paul. Of course I was bitterly disappointed by the defeat of the Astrodome renovation bonds last week, especially given that all of the polls had it passing easily. It looks like those polls created an unwarranted sense of complacency both among campaigners and pro-Astrodome voters who didn't turn out. Based on the outpouring of "don't demolish it!" sentiment over the last week, I'd say the majority clearly support re-purposing it, they just didn't bother to vote (13% turnout!). Forget Monticello or the Chrysler building: There may be no piece of architecture more quintessentially American than the Astrodome. Wow. If we tear the Astrodome down, I'm convinced it will become Houston's Penn Station moment, forever regretted. Mothball it, minimize maintenance costs, and wait and see if a more compelling option backed by private money comes forward at some point. The high cost of demolition in both dollars and potential regret can be avoided. Invest the minimum amount possible to make it a festival park for year-round climate controlled festivals (rather than just the spring and fall as they do now). I'd say that involves fixing the climate control and giving access to the floor while cordoning off/mothballing all of the upper levels. This also preserves future options. Value engineer the Slattery proposal to strip it down to a steel structure over a greenspace park (similar to the Eiffel Tower) at a cost marginally above full demolition ($78 to $98m). Get input from the OTC and Rodeo on how to structure the covered/rain-protected greenspace best for their needs. Revamp the proposal and try again next year when more voters will turn out for congressional elections and pro-Astrodome forces can mount a more effective campaign. Renovate the Astrodome to provide all of the functionality a new Reliant Arena is supposed to provide. Find wealthy backers to support the STEM institute/museum concept (big picture) or Astrodome Tomorrow's concept. They don't necessarily have to support the full cost, but enough to justify a public-private partnership. In the meantime, someone has developed a clever flag to rally support around the Astrodome and prevent demolition. Show your support and buy the shirt - I did. A lot of smaller misc items this week, but by far the most important one is to VOTE TO SAVE THE ASTRODOME on Tuesday. Even if you're not thrilled with the plan, it saves it from the wreaking ball and preserves future options. I've also heard it's very cost competitive on a sq.ft basis with other convention centers recently built around the country. Watch this excellent 5min video on the history of the dome and the plan and I think you'll be sold (click the bottom right brackets to make it full screen). Pics from the Save the Dome truck in case you missed it. Hat tip to Andy. Houston the biggest gainer of middle-income jobs since 2007, and Texas owns the top 4 spots. This is a major problem around the country, and Texas is one of the only places robustly creating such jobs. 288 toll road project close to approval. Great post on the rise of Megabus, including a national route map. Private high-speed rail moves forward in Texas between Houston and Dallas. If this happens I suspect it will end up making the CA line look really bad by cost comparison. This technology is really interesting: a wrist band that can make you feel hotter or cooler than it really is. One day this could help solve Houston's "it's too damn hot and humid to be a pedestrian" problem. Hat tip to Jay. Houston dominates Texas economic stats out of proportion to its population. Even more can be found in the GHP October issue of Houston Economy at a Glance. Note the rapid rise in our GMP. We have 2% of the US population but 3.2% of its GDP. These items come from Patrick Jankowski's research at the Greater Houston Partnership. I highly recommend you start reading his new blog on the Houston economy, The Glass Half Full. 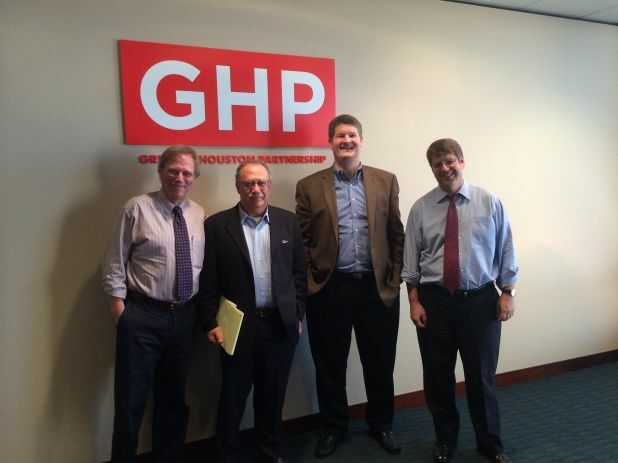 Dr. Stephen Klineberg, Joel Kotin, some nobody local blogger, and Patrick Jankowski at the GHP Oct 24th.